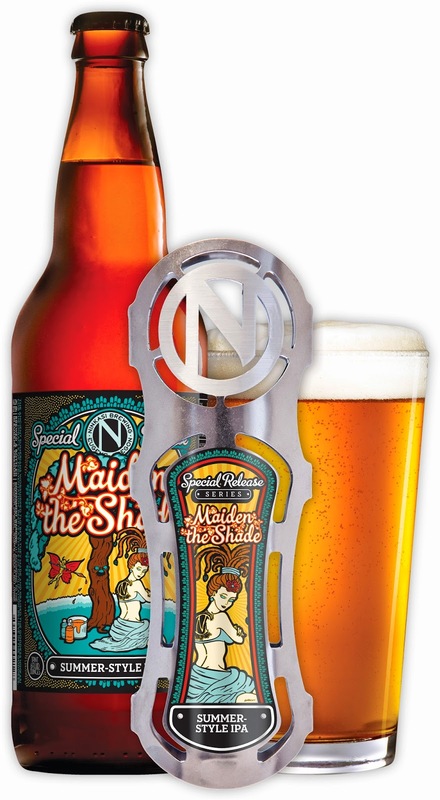 EUGENE, Ore.—May 8, 2014—Nothing marks the return of summer like the release of Maiden the Shade from Ninkasi Brewing Company’s Special Release Series. Officially released for the first time in 2009, this summer-style India Pale Ale has quickly become a summer favorite at the brewery and for those who worship the return of warmer months and outdoor adventures. This year, Maiden the Shade fans can look forward to a bigger, bolder hop profile. “We bumped up the front hop perception and aroma this year to give it even more delicious flavor,” says Floyd. Brewed with eight different hop varieties, this beer has an even bigger, more flavorful hop profile that is as delicious as much as it is smooth. Maiden the Shade can be found in 22-ounce bottles and on-draft May through August. Description: In salute to the playful side of summer, we had fun with this beer! Maiden the Shade has a big, robust hop character from the liberal use of seven different hop varieties. It’s completed with a light-colored malt backbone to stay in balance. Kick back and enjoy! Tasting Notes: This beer has been dubbed a summer IPA. Big powerful combinations of many different kinds of hops give a big hop profile. We added flaked barley to the beer to make for the smooth body and lighter summer-style IPA. Another Ninkasi cult favorite!